Summer, one way or another, is associated with nature and picnic. What's a picnic without skewersand cooked over charcoal on a cool evening? 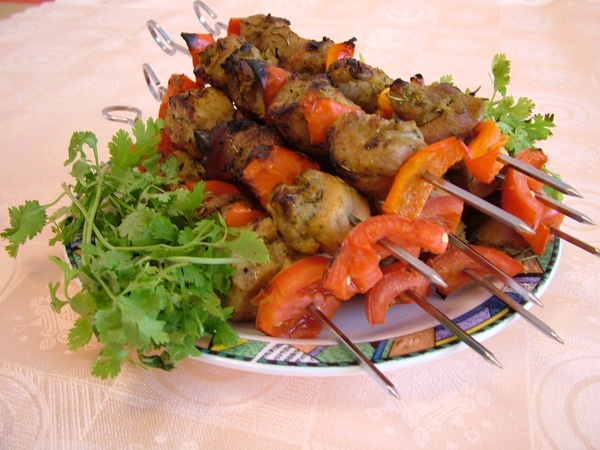 The basis of soft and juicy meat marinade, especially for mutton. To prepare the right marinade is not difficult, important to follow the recipe and the exposure time of the meat. A marinade based on vinegar. Rinse the lamb under running water and dry. Cut it into serving pieces and put in an enamel bowl. Add chopped onion, parsley, lemon juice, vinegar and oil. Add salt, pepper and put in the refrigerator for 4-5 hours. The onion marinade. Mutton wash and dry. Cut into portion slices and lay in an enamel bowl (glass). Add finely chopped onion (can be ground in a blender), tomato pulp, chopped herbs, lemon juice, dried barberry, soy sauce and spices. To withstand the meat for 5-6 hours in a cool place. Marinade yogurt. Lamb rinse and dry on paper towels. Cut into portion slices and lay in an enamel bowl. Add the chopped onion, yogurt and vegetable oil. Season with spices and let stand the meat for 5-6 hours in a cool place. Cooked meat served with lots of fresh herbs, garnished it with vegetables.